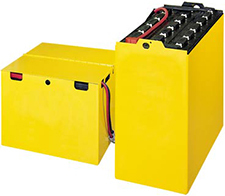 If you are operating electrical forklifts on your jobsite or in your warehouse, you’ll need to consider power sources for your units. 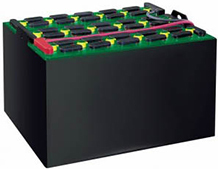 At Bahrns Toyotalift, we carry a wide variety of forklift batteries so that you can find the right battery for your forklift. Getting the right combination is key to ensuring a long and productive life for your battery, and ensures that your forklift can be depended on to work all shift, every shift. 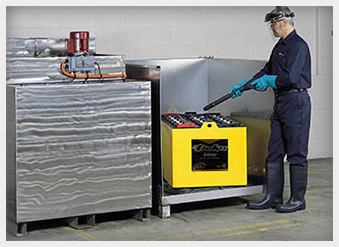 • A visual inspection of the overall condition of the battery, including looking for evidence of improper filling, damage from fluctuating operating temperature, or corrosion. • Check and record electrolyte and water levels, and fill as needed. • Clean the battery and container. • Check vent caps for damage, cracks, or missing caps. • Check around the battery unit for frayed or broken straps, cable, and connectors. • Inspection of charging cables, housing, contracts, torque connects, and the amp meter. • Verification of charging rate. • Vacuum and clean out the inside of the charger. • Provide recommendation on repairs. So get in touch with the staff at Bahrns ToyotaLift if you need help figuring out the right battery and charger for your forklift or other lifts, or if you need maintenance on current equipment that you are using. Our staff can work with you to set up a long-term schedule, and let you know when replacement may be necessary. Bahrns Equipment and Bahrns ToyotaLift have been providing warehouse solutions for the Central and Southern Illinois regions for almost fifty years. They are experienced with Toyota forklifts, from Class II Narrow Aisle forklifts up to heavy-duty Class V lifts. Located in Effingham and working in surrounding counties including Fayette, Lawrence and Richland, we know the communities and the businesses well. Call Bahrns ToyotaLift today for information and more.